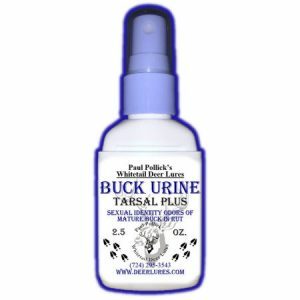 Buck urine, Interdigital, tarsal gland and other attractors that closely imitate the natural urine and gland scents of a mature buck during the pre-rut. A good lure to use in early season buck scrapes. Buck Musk and Urine is very effective when buck are traveling together in pre-rut or while regrouping after breeding has concluded. This buck lure will lay a full odor trail or can be hung in shooting lanes near stand.